Potatoes tend to get a bad rap, which is a bit unfair. Even kale would be considered unhealthy if it were constantly served fried, or as a vehicle for processed cheese and bacon. Potatoes are actually rich in a number of important vitamins and minerals, and they're a particularly good source of potassium, which can help positively regulate blood pressure. So it's fine to enjoy potatoes if you prepare them in a healthy way. But if you really want to ramp up their benefits, don't just change the way you prepare them. Change the type of potato you buy. I'm sure you know that the darker or more colorful a fruit or vegetable is, the healthier it tends to be. After all, there's a reason kale enjoys that "superfood" reputation that iceberg never had. And let's face it, regular old potatoes are about as bland as it gets when it comes to color. Sure, you can get potatoes that are red or yellow on the outside, but they're still the same old white on the inside. However, those aren't your only options. 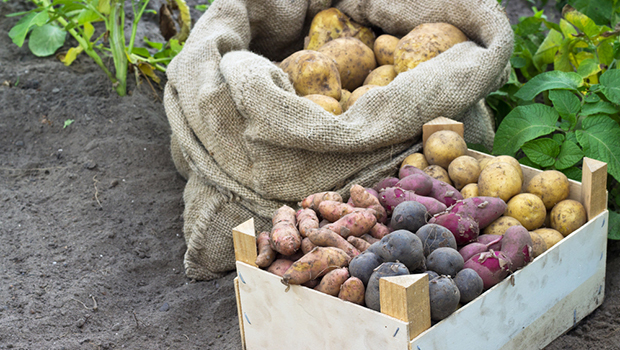 Did you know that potatoes also come in purple? They do! And they aren't just purple on the outside — they're purple all the way through. These purple potatoes aren't just interesting to look at; they're healthy too. That's because dark blue or purple foods typically contain an antioxidant called anthocyanin. And purple potatoes are no exception. This makes them even more effective at reducing blood pressure than just plain old regular potatoes. In fact, the USDA conducted a study of overweight participants who had high blood pressure. The participants ate six to eight small purple potatoes twice a day for one month. And their blood pressure went down by an average of 4%! Another small study found similar results. The researchers suspect this is because the antioxidants in the potatoes help keep your capillaries and blood vessels healthy. It also may be because purple potatoes have a high concentration of a phytochemical called chlorogenic acid, which is connected to lower blood pressure in mice. Even better, these antioxidants also support your immune system, making you better able to fight off cancer and heart disease. And they help protect the structure of your DNA, so you're less susceptible to the mutations that can devolve into cancerous cells. Anthocyanin even has anti-inflammatory properties and can regulate your negative estrogen, reducing your risk of diseases related to your hormones. Many natural grocery stores carry purple potatoes, and you can often find them at farmer's markets. You can use them just as you would regular potatoes — try mashing them to startle your guests at dinner. Just remember, as with regular potatoes, you can easily overshadow their benefits if you overdo it with the condiments. For everyday use, try steaming, baking, or roasting them with a little olive oil and some fresh herbs to let their flavor and nutrition be the stars.